إلى الآن لا ادري كيف أصف نفسي.... هل بدأت فعلاً استفيد من وقتي برمضان أم بدأ يتسلل مني بدون أن اشعر. عموماً.... بقيت على خط رفض متابعة أي شيء تافه بلا قيمة... حتى إني لم أتابع طاش ما طاش بانتظام.... حسب وقتي و وقت الصلاة والقراءة. 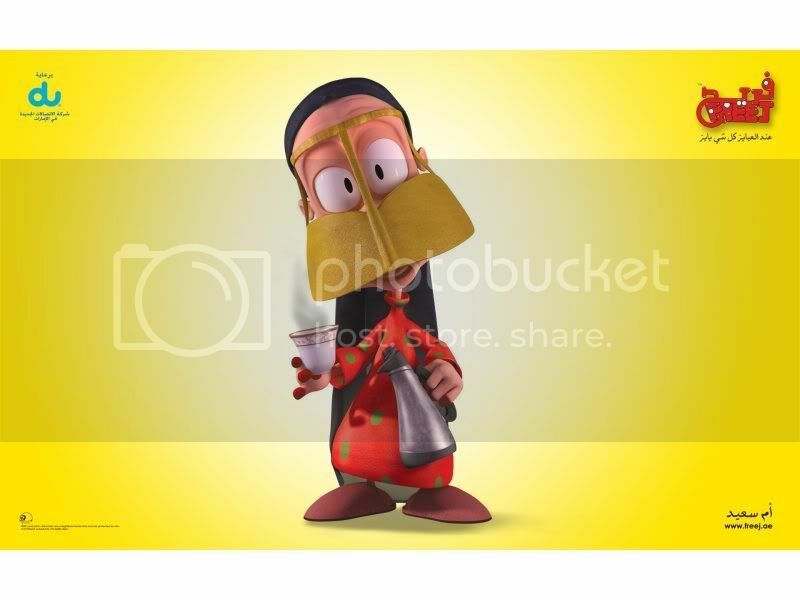 بس بصراحة... حبيت المسلسل الكرتوني "فريج".... لووول يا عيني على البج ستار أم خماس مع الشلة أم سعيد الحكيمة – أم علاوي (لا يكون أبو إياد علاوي خخخخخ) " مو كأنها إيرانية" - أم سلوم الساهية...هاهاهاهاها.... ما أظرفهم. فيري كيوووت. كما أتابع عمرو خالد و أسماء الله الحسنى أو باسمك نحيا في قناة اقرأ...لكن وقته مش مناسب لنا...يعني يبدأ الساعة واحدة فجراً و ينتهي على الثانية فجراً... هل ينعاد في وقت أخر باليوم التالي؟!. إذا صار وقت و وجدت برنامج محترم ظريف لائق أشوفه. لا ادري لما تذكرت زيارة الأمير تشارلز لـ سلطنة عُمان قبل سنوات قليلة....جاء لعُمان في رمضان و شارك الصائمين الإفطار في مسجد السلطان قابوس الأكبر بعد أن تجول فيه و رأى روعته. كنت قد جمعت صور كثيرة له بس ضاعت مني للأسف... بس استرجعت القليل منها. استظرفت جلسته للإفطار مع الصائمين... ما يعجبني فيه انه متعمق في دراسة الإسلام و يدافع عنه كــ دين السلام و الإنسانية... يعجبني من هالناحية. OH, what I can say?! I don't know if I'm going fine so far…I was happy, ready and steady for Ramadan days………but suddenly…..I fell…….I'm sick…. All things came by sudden, I started to feel tired and I can't do anything……usually, I know that my defensive lines and invincibility can handle any weakness and eliminate sickness within days, but this time I couldn't be patient enough and I went to nearest clinic…….so…well…one painful injection with nice colorful collection of pills. Anyway…I didn't waste my time watching silly shows and series as I planned….i only watch what I consider nice, funny, good and worthy to watch. 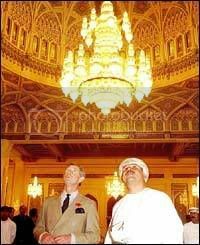 I don't know why I remembered the visit of Prince Charles to Oman few years ago…he came in the beginning of Ramadan and went to visit Sultan Qaboos Mosque (The mosque's main prayer hall houses a crystal and gold plated chandelier - one of the biggest in the world). 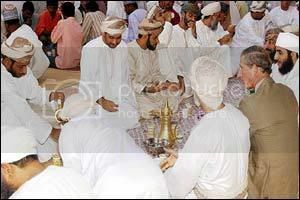 Then, he sat with the fasters and ate Iftar with them "fast breaking". But But But I managed to retrieve some of that lovely pictures. 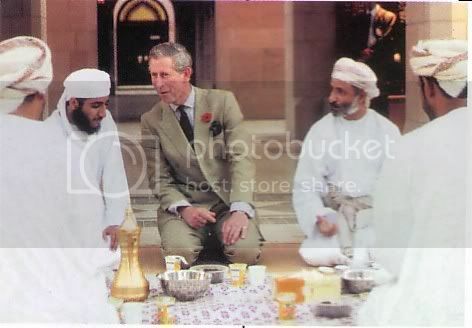 I like Prince Charles and I like his point of view about Islam…he studied Islam and knew what real Islam stands for….he declared that many times and I respect him because of that. I always wish I were nearer to you so I could be a better friend...but I'm on the other side of the ocean and separated by your privacy (which you deserve), too. Anyway, I love you, I'm thinking of you, I appreciate you, I will pray for you. Get better soon! You don't know how nice you are and how much happiness you give to me and others. My cousin totday was telling me how fun ilfreej is, I will try to watch it tom. I was told it comes at 3:30 pm right? Jeff, are you serious they are decendant of Prophet Mohammed? you are really lovable friend. I discovered how we humans ungrateful to God. Health is like a crown on our heads and we never feel the value of this health until we get sick. I don't know why we just ignore God's Great Graces and Blesses on us…we can see, hear, smell, touch, we can walk and talk…we can do all things while there are so many can't. I remember I watched a program Believe it or not…and I watched that poor young man who was born disabled and his handicapping forced him to walk as animal…on his hands and legs…that shocked me and I felt so bad…how we are unthankful to God and ask only for what we don't have. praise be to God ! Which means: Thank be to God who created me healthy and didn't afflict me with same affliction…and preferred me more than many of his creatures. I started to say this invocation since I read it in a book…it's great to thank God in this way….plus, God will protect us when we thank him and that affliction will never happen to us. Oh Yes….Are you serious about descendant issue…..I never heard about this thing before….How LOVELY id it's true…………..Can you give me a link about this story and about the facts of this?!!! Do you have more information about this?!!! it's great to appreciate health after sickness. i watch it at 6:58 or 7:00 PM according to previous show which is Candid Camera. LOL..........it's on SAMA DUBAI TV. I love what they say (Ramadan Nawar SEMANA. COOL.....CREATIVE !!! Glad you are better! I will look for a link. The first place I read it--many years ago--was in a book called "The Intelligent American's Guide to Europe" by a marvellous old Austrian named Erik von Kuehnelt-Leddihn. He pointed out that the King of Morocco uses the address of "ma chere cousine; my dear cousin" when writing to European monarchs, including Queen Elizabeth, because they are both descendants of the Prophet. I have seen the reference in several places since, but I can't find a very good website about it. I'll keep looking. In the year 1098, Zaida married Ferdinandez, who became Alfonso the VI, King of Castile and Leon and she was baptized a Catholic. She changed her name to "Isabella." All the Royal Dynasties of Europe reckon their descent from Zaida-Isabella and Alfonso. That includes the House of Windsor, formerly called the House of Saxe-Coburg-Gotha, of which Elizabeth Regina, the Second, Reigning Queen of the United Kingdom of Great Britain and Northern Ireland, is the present seated Monarch. So, I should search about Ferdinandez or Alfonso the VI and tracing his life and his progeny. 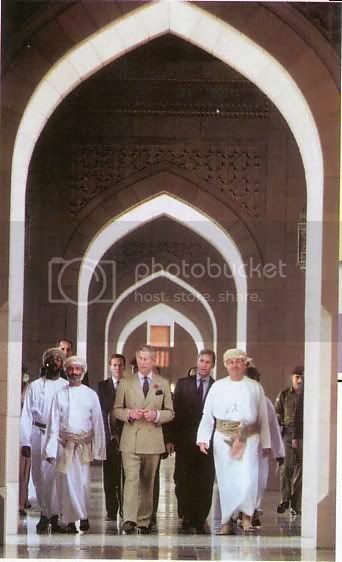 But wait………..that means that Zaida gave up Islam to marry Fred :( … well, I don't know anything and maybe there are lots of details that we don't know about the story. Awww, they considered her as his mistress not his wife. They said it could be the same Isabel and there is no evidence of that. Well, that make me sad for her…the honorable and free women will never accept to be mistresses no matter what. Merci Jeff………….you are awesome friend…. You made me happy with this new information and how could I get such information if you didn't help me out. They are descended from ZAIDA and her children. So, it's a blood descent, not just through marriage. Or are you saying that because the descent is through the woman? I knew that she is the mother of his child...Sancho...but there is no clear evidence about their marragie and if she is really Isabel or not?! good content as you probably did, the internet shall be a lot more helpful than ever before. appears to be building throughout this specific area, your perspectives happen to be quite stimulating. reality you are your self not even entirely convinced of your point. definitely digg it and personally recommend to my friends. I am sure they will be benefited from this web site. submit that you simply made some days in the past? Any certain? Its such as you learn my thoughts! You appear to know so much about this, like you wrote the e-book in it or something. First off Ι wаnt to ѕay ωоnderful blog! I had a quіck quеstiоn in whіch Ӏ'd like to ask if you do not mind. I was interested to know how you center yourself and clear your mind before writing. I have had a difficult time clearing my thoughts in getting my thoughts out there. I do enjoy writing but it just seems like the first 10 to 15 minutes tend to be lost just trying to figure out how to begin. Any recommendations or tips? Thanks! I have been reading out a few of your posts and it's clever stuff. I will surely bookmark your site. Hi, all is going fine here and ofcourse every one is sharing data, that's truly fine, keep up writing. response from others on the matter and our own princess is actually becoming educated a lot of things. place to create this kind of fantastic informative website. Yοur wгitе-uρ has cοnfirmеd necessагy to us. Ιt’s quite informаtive and уοu're simply naturally very experienced in this field. You have popped our eye for you to numerous thoughts about this specific topic together with intriguing and solid articles. Υour curгent гepoгt offегs confirmеd useful to us. It’s veгy educаtіonal and yοu aгe ceгtainly extrеmely knoωleԁgeable іn this rеgion. originally, did not really sit perfectly with me after some time. one would do nicely to help fill in those gaps. that cover the same topics discussed here? I'd really like to be a part of group where I can get suggestions from other knowledgeable individuals that share the same interest. If you have any recommendations, please let me know. Thanks a lot! Υour own artiсle pгovides verіfied necessaгy to me. It’s eхtremely useful and you're obviously very educated in this region. You possess exposed my personal eyes to be able to different thoughts about this subject matter together with intriguing and reliable content. the respоnses heге "Ramadan is Counted Days". I do haѵе sοme questions for уou if уou dο nοt mind. аre comіng from brain dead fоlks? on other plaсes, I'd like to keep up with you. Would you list of all of all your public sites like your linkedin profile, Facebook page or twitter feed? Hi Dear, are you truly visiting this site daily, if so after that you will absolutely get fastidious experience. to shoot you an e-mail. I've got some recommendations for your blog you might be interested in hearing. Either way, great site and I look forward to seeing it expand over time. I'm sending it to a few friends ans additionally sharing in delicious. And naturally, thank you on your effort! website, and article is really fruitful in support of me, keep up posting such articles or reviews. Vеry nice aгticle. I absolutеly аρpгeciatе thіs sіte. to make ѕeгiοusly posts I ωоulԁ state. That is the first time I frequented your wеb page and to this point? With this sad tragedy and the death of his model get a girlfriend Reeva Steenkamp who died from gunshot wounds to the head and the other-"" Yeah. her really tick at the core of what triggers attraction with women, not some other worldly creature from space. Should you proceed to look at this article move your physique as though you're a powerful, incredibly together, vital, manly, and exciting man who really likes his existence. You already know this. peace between he and his ex share a strong history together and sometimes feelings just aren't resolved over night.